Currently, users can get stuck in a permanent flag hellban from which there is no recovery. Users can enter this hellban even if they have many more helpful flags than declined flags. Subsequently, their future flags are never reviewed, despite the likelihood of being helpful. Hellban flags are tracked silently. If another user flags the same post (and that flag is marked helpful), or if the post is deleted, the flag counts as "helpful" (not actually marked helpful until the user is unbanned). Once the user reaches a certain threshold (perhaps related to measurments that trip the hellban) of "helpful" flags, and at least 2/3 of their hellbanned flags are "helpful", the ban ends. This allows good users who get hellbanned because of a bad streak to come back from it. The hell-ban is no more! Long live the verbose, obnoxiously evident ban! ...and will be unable to flag any further posts for any reason. Flags considered for the purpose of these warnings / bans are currently limited to post flags which often require explicit moderator intervention: Other, Spam, Offensive, Very Low Quality, Invalid Flag, Close and Not an Answer. 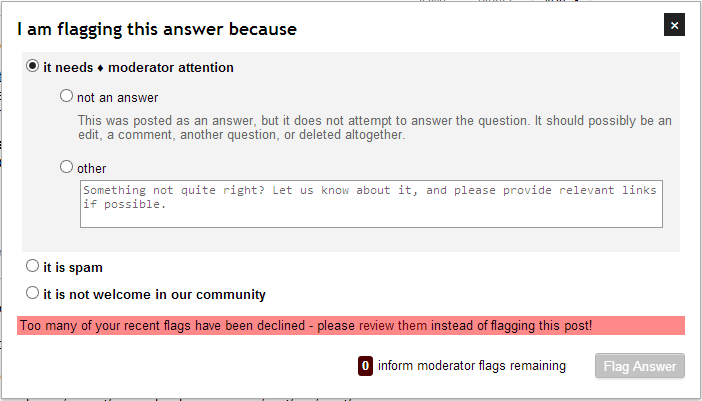 I'm not 100% on the value of including close flags in this: we spot-tested these criteria with and without them at various times, and the downside to including them is that they can end up making some folks' flagging histories look better than they appear to the moderators. However, these are listed on the flag summary page that's linked to from the warnings, so for now we'll include them and see how it plays out in practice. Hopefully, this will help less prolific flaggers learn to use the system correctly without repeatedly wasting their time and that of the site moderators. We'll be keeping an eye on this and adjusting these thresholds as-needed. Please report any problems you encounter here on meta, using the tag declined-flags. Only look at folks who cast at least 10 flags a week. There isn't much point in doing much to knock the priority of flags from people who rarely flag anything. If at least 10% of your flags from the past 7 days were declined, you'll get a little warning next time you go to flag something... Along with a link to your flag history so you can see exactly where the problems arose. If at least 25% of your flags from the past 7 days were declined, you're blocked from flagging anything. Depending on when and how those declined flags were cast, this block could last for as little as a day, and won't ever be longer than a week. For users with less than 10 flags in the past week, look only at the status of the last flag - if it was declined, then warn as above (but with the message "Your last flag was declined..."). This handles the case where new users are confused as to what "flag" is supposed to be used for. Over time, the flag system has evolved from a rather opaque "I saw a problem, please do something" system into a way for everyone to work hand-in-hand with the elected moderators. For this to be effective, it must include feedback on how well you're flagging - closing that feedback loop should help our more prolific flaggers to become better at flagging, and reduce noise for the moderator teams. I've notice that these flags appear in the queue if other users have flagged the same post. However, marking these flags as helpful doesn't increase the user's helpful flag count, and shows no change to the flag in their flagging history. If any other (non-hell-banned) user flags the same post, the hell-banned flag should come out of the void and act as a normal flag. Once the user no longer meets the criteria for the ban, it is lifted. Although I would prefer a more systematic, automated approach, it is worth noting that it is technically possible to raise hellban by manually "resetting" user flagging history. One case when it has been done at Super User is described here. In brief, there was sort of a strong community consensus that particular series of flag declines deserves an exceptional treatment. Following this consensus, user contacted SE team and developers removed some of their flags from database. Not the answer you're looking for? 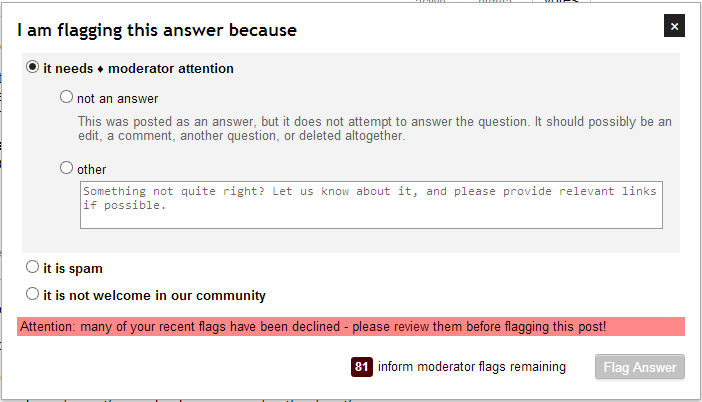 Browse other questions tagged discussion feature-request status-completed flags flag-ban . What happened to flag weight? What is the difference between disputed and declined flags? Is the Very Low Quality flag too ambiguous? Are there manual flag bans?